Spring has finally sprung here in the mid-Atlantic states... the grass is greening up and birds are chirping. To go hand in hand with these welcome sights and sounds, here's a pretty gathering of pastel tutorials for dressing a table in springy decor. 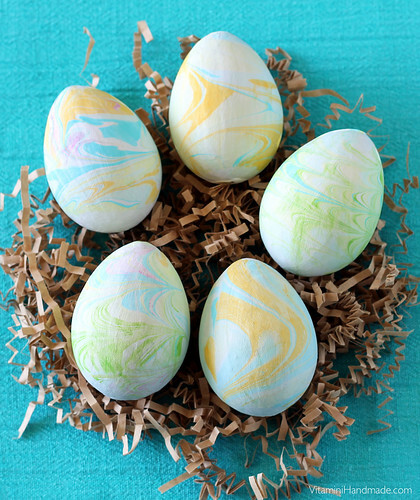 Casey Starks of Vitamini Handmade shows how to make beautiful marbled paper mache eggs that can be part of your Easter decorations for years to come. Use the same technique to marble sheets of paper. Liz Fourez of Love Grows Wild shows how to make delicate watercolor flowers. 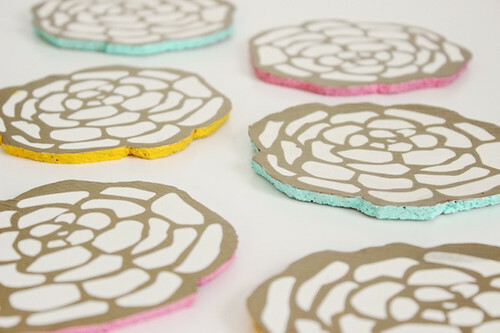 Mandy Pellegrin of Fabric Paper Glue shared a tutorial for making paper covered floral cocktail party coasters on Oh So Beautiful Paper - they'll come in handy all spring and summer long. 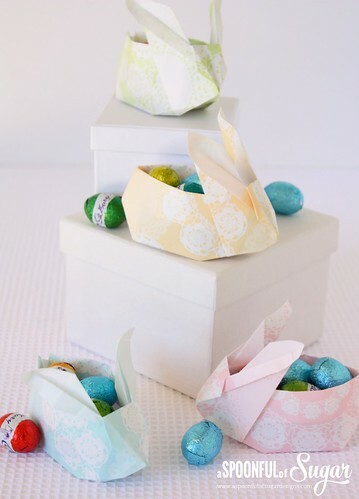 Lisa and Sarah of A Spoonful of Sugar made cute origami bunny baskets by following Leyla Torres's original tutorial and video on Origami Spirit. 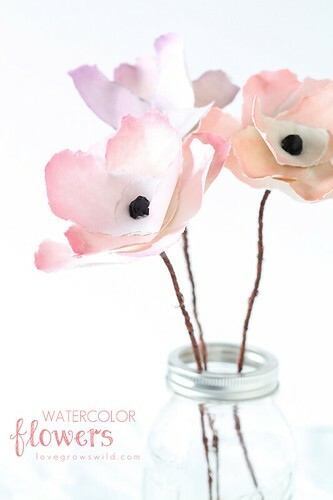 Lucy of Crafterberry Bush used crepe paper and embroidery thread to make duo color peonies. 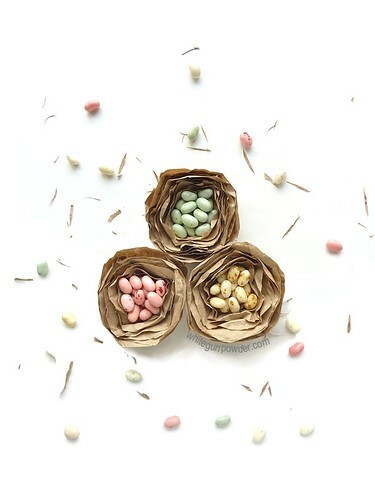 Kay and Bill of White Gunpowder share their idea for making brown paper bird's nest favors. 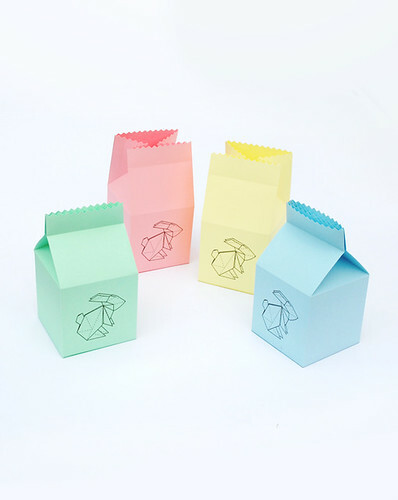 The nests could be packaged to go home in sweet origami bunny treat boxes by Kate Lilley at Mini-eco. This egg project that isn't exactly a paper craft, but I made the executive decision to include it because 1. the satin stripes are just so pretty! and 2. cardboard is involved... so technically it counts. 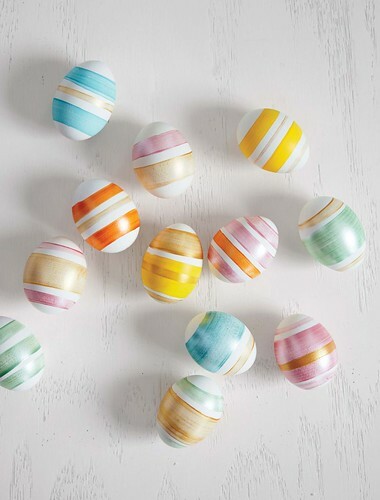 :) Head over to Suzonne Stirling's Urban Comfort to learn how to stripe an egg, as found in the April issue of Martha Stewart Living. Love the peonies and birds' nests. 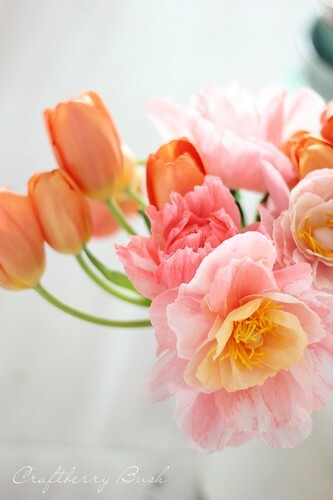 Ooh those paper peonies are almost as beautiful as the real thing :-) What a fun DIY! Ooooh, lovely. We've tried the paper nest and it's so simple but so pretty! Thanks for all the finds Ann. The gorgeous blooms are a must try. Lovely finds, thank you so much for sharing them.